Carnival Cruise Lines has published a behind the scenes video tour charting the construction progress of Carnival Vista, its latest “Fun Ship” due to launch in May 2016. The monthly video series covers the ship’s 26-month construction and is hosted by Peter Gonzalez who was tasked with travelling from Miami to the Fincantieri shipyard in Monfalcone, Italy to tour behind the scenes of Carnival’s latest 3,954-passenger cruise ship. Gonzalez has previously toured 10 ship yards, visited over 30 countries and has sailed on nearly every vessel in the Carnival fleet. 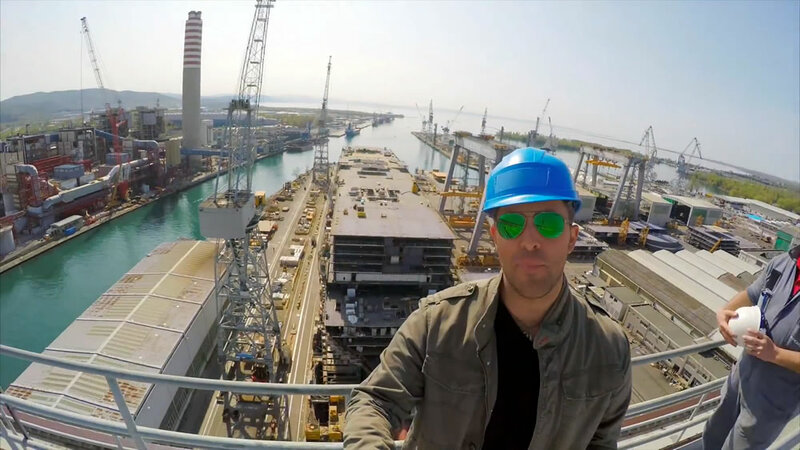 In this first episode Gonzalez dons a hard hat and ventures high above the Fincantieri shipyard to demonstrate the incredible size of Carnival Vista while highlighting the painstaking process for cutting and assembling the 150,000 tons of steel needed to build the massive 1,055-foot-long vessel – the largest in the Carnival fleet. He visits the fabrication bunker where six tonne steel panels are cut and formed into sections weighing up to 1,000 tonnes. These are lifted by a remote controlled crane onto Carnival Vista’s superstructure. Future segments in the series include preparations, both on board and ashore, to create the line’s first on-board brewery, a below-deck look at the ship’s technical spaces, and the logistics of installing the three-deck-high IMAX Theatre. Videos will also track installation of innovations such as SkyRide, a one-of-a-kind suspended cycling experience, and a new 455-foot-long tube slide called Kaleid-o-Slide. In this episode Gonzalez takes a look at the ship yard and specifically at the power generation equipment being installed on-board. Interesting information appears throughout the video including the fact that six million meals are served per year in the shipyard. Cesare Boldrini, chief engineer of Carnival Vista, suggests that 85 percent of the equipment being installed has never been installed on any other Carnival vessel to date. As the superstructure is nearly complete Gonzalez turns his attention to the RedFrog Pub and Brewery in this episode. It is the aim of Eddie Allen, Vice President of Beverage Operations, to have beer brewed in the on-board brewery ready to serve guests on the very first public sailing. This episode opens as Carnival Vista hits a major milestone as she is now in wet dock. Gonzalez explains how the development has shifted from a macro level to the micro level, with individual spaces now taking shape. He also talks to Christine Duffy, President of Carnival Cruise Line, on what she is most looking forward to on-board. This episode offers an insight into the prefabrication process of the 2,473 staterooms being fitted inside Carnival Vista. The video also examines the unusual method of installation of the IMAX screen on-board. Bookmark this page and come back next month to watch the next episode in this series. Carnival Vista is scheduled to enter service on 1 May 2016 where she will operate Mediterranean itineraries sailing from Barcelona, Spain and Athens, Greece. On 21 October 2016 she will sail on a repositional transatlantic itinerary from Barcelona to New York for a series of voyages in November 2016. Later this month she will reposition to Miami and operate year-round Caribbean sailings.